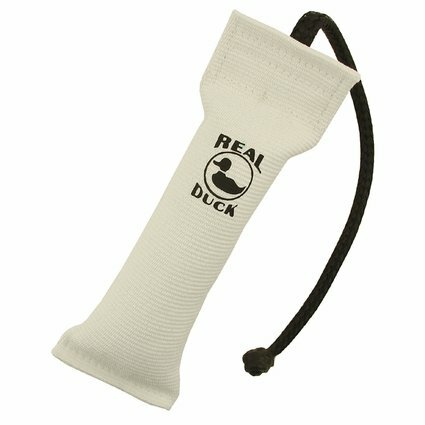 Real Duck 2 in. x 9 in. Small Puppy Dummy. $10.99. Good construction. 'Cloth' covering can withstand puppy abuse. Light and the right size for a teething pup to train with while her mouth is tender. Great with my grown retrievers too. The quality justifies the price. Excellent tool for starting young puppies. These puppy bumpers are soft, so the dogs learn to have a soft mouth. Great size for my 4 month pup. Made well. Durable, easy to see and pup loves it! I am just starting out with retrieving, and my 11 month lab really likes it. It fits in his mouth well not to heavy. Made well, easy to just wash it off. Good size for a beginner pup. 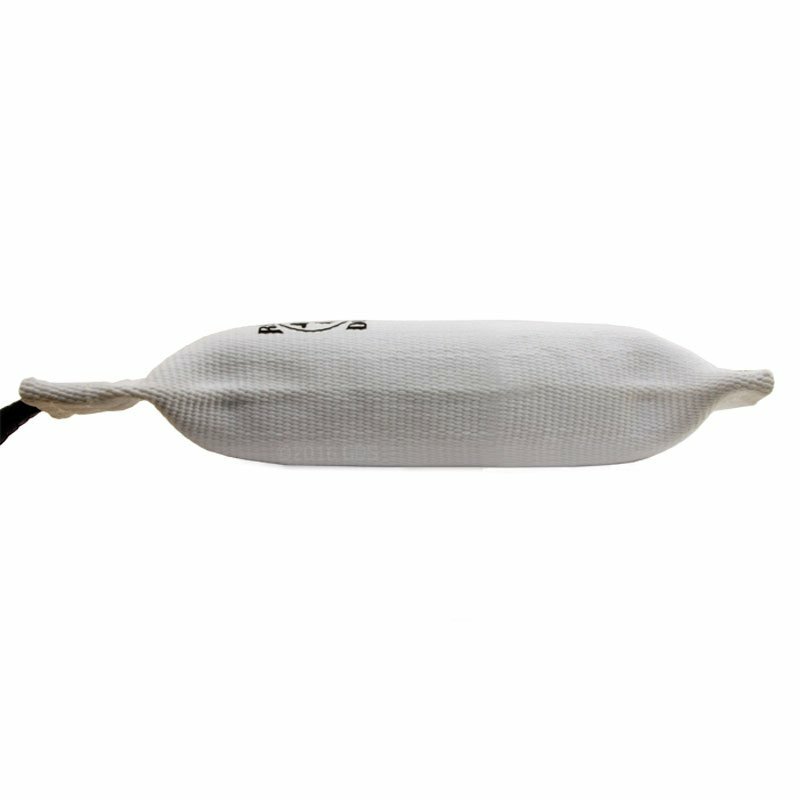 I've always used canvas dummies, and this canvas puppy dummy is the best money can buy. Great product. Yellow lab is 3 months old, and it fits perfectly in his mouth. Not to big. Floats high in water really well. Very tough material too. He uses it for a chew too as well and has yet to puncture it. "Soak in hot water so it gets soft enough for puppy teeth." Soak in hot water so it gets soft enough for puppy teeth. "We are very satisfied with this product!" Our 5 month old lab pup had showed only a moderate interest in retrieving. 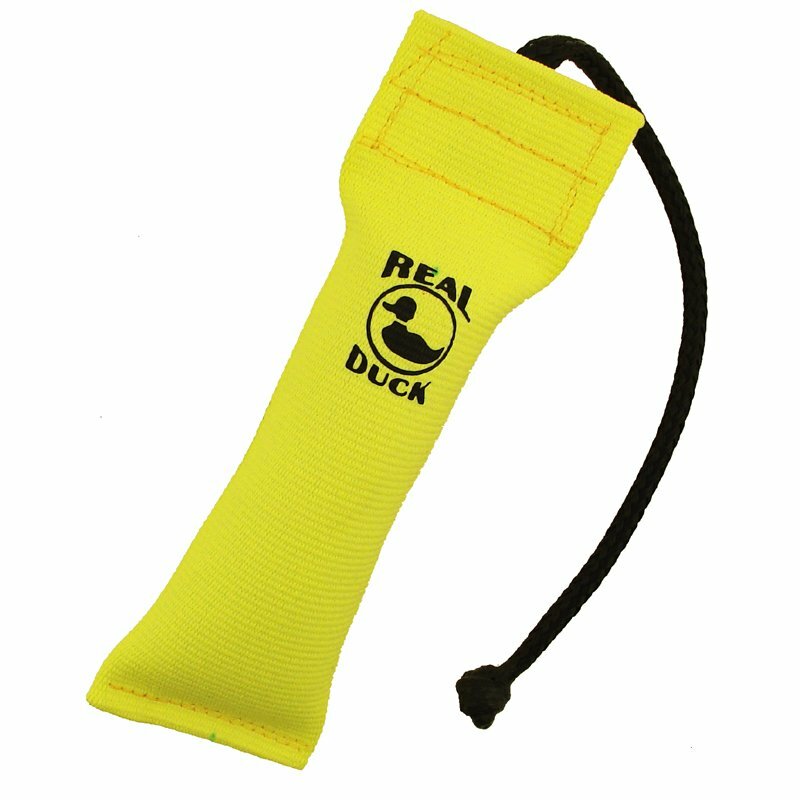 Once his real duck dummies arrived, and we started using them, he showed a lot more interest. Now when I take them out he gets very excited and can't wait to get going. We are very satisfied with this product! Durable, quality product. Great for my puppy who is 10 weeks old and I am know I will get much more use! "Excellent quality worth every penny!" Excellent quality worth every penny! I completely recommend it. "Fits our purpose just fine!" Fits our purpose just fine! Holding up great so far too. Great feel to this dummy. Great weight. Just perfect. "Found what was needed and more.. It's tough, too!" Found what was needed and more.. It's tough, too! 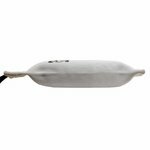 "Also a good bumper easy for a puppy to hold onto." Also a good bumper easy for a puppy to hold onto. Black and Yellow Lab. Hunts. Family pet. Very Durable, great shape for the dogs mouth. Floats nice. Great Product. High quality, very durable. One of my dogs favorite bumpers. "I purchased this dummy for my neighbors new puppy, and she just loves her new toy." I purchased this dummy for my neighbors new puppy, and she just loves her new toy. My dogs are already into the large dummies and retriever gun dummies. "They are the best I ever had." Wear well. They are the best I ever had. Very lightweight and easy for my puppy to pick up. The throw string was a little long. He kept tripping up, but I cut it and tied another knot. Works great now! I bought this for my 20lb mini schnauzer for dock diving in the color white for visibility. My dog loves the toy and it works great for training. However, after one use the white canvas turned light brown. Kind of looked like something inside had leaked. (My dog is not a hard biter) I tried rinsing it off in cold water but it is still stained. I would maybe recommend a different color. Little too small for my dog. I guess I waited too long to buy it. "looks like a quality product"
We haven't actually used it yet, but it looks like a quality product. My order arrived very quickly, and we will be ordering from GunDogSupply.com again. My opinion is that these dummies are too hard for puppy training. I would prefer some a little softer to make sure I do not damage their teeth. Also, I would prefer a dummy with no rope on it to prevent the puppy getting into a bad habit of grabbing and shaking the dummy by the rope. I have seen this issue occur many times. Not easy to break once it occurs. Best Regards, Charlie Palmer - Charlie's Champion Chocolate Labrador Retrievers. Thought it would be a little softer for the puppy especially with their baby teeth in. Nylon rope frayed, Had to cut it off. 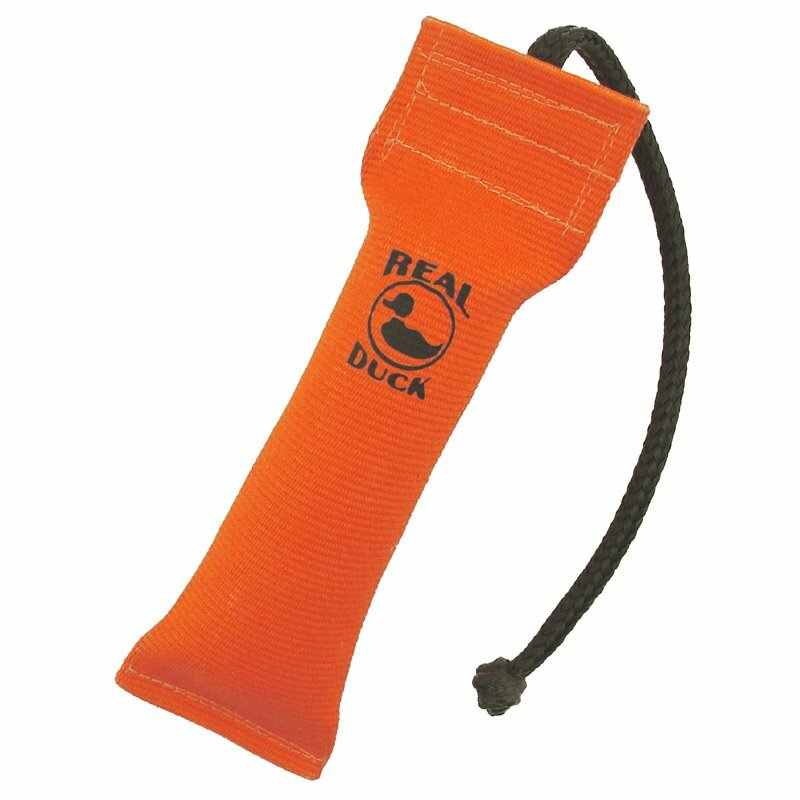 Real Duck Premium Dog Training Dummies have been engineered to be a training tool that you can count on: A dummy that is incredibly rugged, really holds scent and still feels and floats like a Real Duck for excellent training results.